While society's acceptance toward mental illness has improved over the years, it is still the most stigmatized of all medical diagnoses. To help protect those with a mental illness, the Mental Health Alert Wristbands were created so that the wearer's diagnoses is concealed yet is easily identifiable to those who can help in the most critical of moments. Purchase a Mental Health Alert Wristband or make a donation to help those who can't afford one. All donations will go toward helping those who cannot afford a wristband. Wristbands are $2.50 each. See contact page for shipping and packaging. This wristband stands as a symbol that is bringing Law Enforcement together with those who have a mental illness. In a circle of unity, the navy blue represents Law Enforcement and the silver represents those who have a mental illness. On the outside of the wristband are the Med Alert symbol, CIT (Crisis Intervention Team) acronym, and the CIT ribbon. These serve as an outward sign to all Law Enforcement that the wearer has a mental illness. They are also a reminder to the wearer to ask for a CIT Officer when in crisis. Printed on the inside are the words Mental Health Alert. This helps keep the wearer’s diagnosis confidential. In turn Law Enforcement can wear these as CIT awareness wristbands. This will be an indication to a person with a mental illness that this Officer is CIT trained and can feel safe approaching or being approached by this Officer. These are to be worn by those with a mental health or dual diagnosis or a CIT Law Enforcement Officer. Wristbands are $2.50 each, which includes the brochure that explains the purpose of the alert bands. All proceeds from sale of the wristbands are used to purchase more wristbands so that they can be given to those who can't afford them. Special individual packaging is available upon request. Nationwide and international shipping is offered for an additional cost. Please contact us for details about packaging and shipping. Dottie Bailey, who has lived with a mental illness since 1989, created our Mental Health Alert Wristbands. She is a Crisis Intervention Team (CIT) Community Instructor and a Certified Peer Specialist. 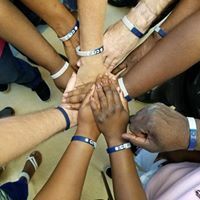 Dottie was inspired to create the wristbands after meeting many law enforcement officers in Crisis Intervention Team (CIT) classes who requested some way to identify individuals with a mental illness. Her greatest desire is for law enforcement and people with mental illnesses to come together so lives can be saved. Dottie has a Bachelors Degree in Business Administration from Wayland Baptist University. She received the Consumer Advocate of the Year Award for the State of Georgia in 2012. Over 50 Please contact for applicable shipping cost.